We’re your independent, locally owned bookstore located in the heart of Vineyard Haven, on Martha's Vineyard. We’re a community of writers and readers, featuring a carefully curated selection of the finest books and sidelines, and hosting author events year-round. Bunch of Grapes has been on the island of Martha's Vineyard for over 40 years. Dawn purchased the bookstore in 2008 and has made it a priority to keep it on Main street in Vineyard Haven. She purchased the bookstore from long-time owners the Nelson family whom she had worked for as an events coordinator. Prior to owning the bookstore, Dawn worked at a trucking company and hardware store which were both owned by her family. She also owned her own catering company and taught preschool for many years. For her first year on Island she taught at the Chilmark School. After a fire damaged the store's inventory, furniture, and fixtures, Dawn kept it afloat by temporarily moving to another space. 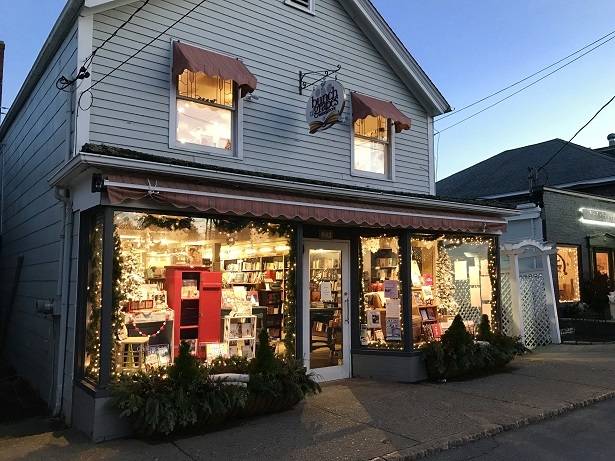 Since then, the store has changed locations a couple times, but has always remained in the heart of downtown Vineyard Haven, supplying visitors and locals with a great selection of books. "Two things I'm proudest of about the bookstore: our depth and breadth of selection given that we are a small independent bookstore who does most of their business in two months of the year, and our author event program, that year after year brings the finest authors to the Vineyard to give talks and sign books in a very intimate setting. I will forever be grateful to our loyal year-round residents who have supported us with every move and who are the reason I keep going. Every time I hear, "I'm just so glad you are still here!" it makes me so happy. I will always believe in the power of reading, and it has now been proven that reading the physical book vs an ebook is so much better. I'm excited about our future!"